...although I'm not sure it ever existed. I have the one before, rev J, and the new Atmel style one which followed, 42735A but if anyone has rev K I'd like a copy please. Thanks, my interest is purely one of curiosity. 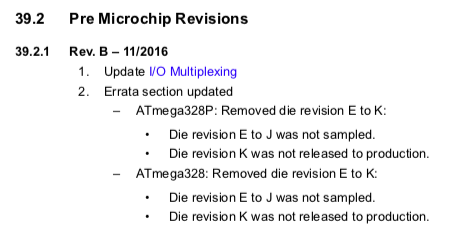 Datasheet 8271J, the last old-style Atmel datasheet mentions rev K silicon and the removal of full-swing in the errata but not in the body-text. Datasheet 42735A, the first new-style Atmel datasheet, mentions rev K silicon and the removal of full-swing in the errata but not in the body-text.